Age spots are unpleasant-looking brownish-black colored spots that are flat – not raised – on the skin. They commonly appear on people who are over the age of 40, and are also known as liver spots, sun spots, solar lentigines and senile lentigines. These spots are a part of the skin’s response to sun overexposure. WHERE ARE AGE SPOTS MOST LIKELY TO DEVELOP? According to dermatologists, age spots usually appear on areas of the body that receive a lot of sun exposure. These areas include the backs of the hands, the shoulders, the neck, the arms and the face. Most age spots are not physically harmful unless they begin to turn black, but many people associate them with aging and thus find them undesirable. Strongly pigmented and prevalent age spots may lead to feelings of self-consciousness. Many people seek to reduce the appearance of their age spots. You should see a dermatologist for a good skin exam if your age spots are beginning to turn black. WHAT CAN I DO TO PREVENT AGE SPOTS FROM APPEARING? 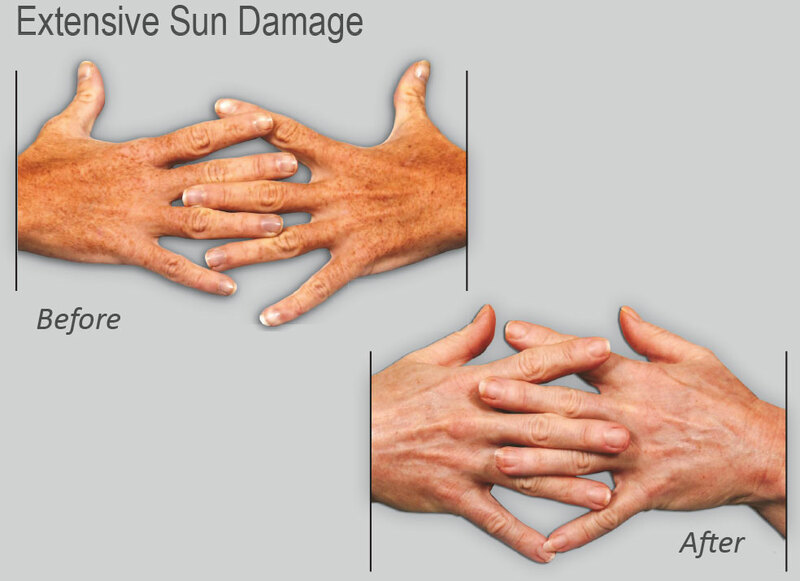 Age spots can be prevented if you avoid sun exposure, especially when the sun is its midday peak. If you absolutely must be out in the sun, make sure to wear protective clothing, like hats and long-sleeved shirts, as well as plenty of sunscreen or sunblock. Following a daily skin care regimen that includes sunscreen that is at least 15 SPF is the best way to protect your skin from the sun’s harmful rays. CAN AGE SPOTS BE REMOVED FROM THE SKIN ONCE THEY HAVE FORMED? Topical creams containing hydroquinone are available over the counter in low concentrations and prescription strengths are available from your doctor. These creams are beneficial but work very slowly and must be used with sunscreen. Laser treatments are effective at removing age spots, and sun exposure is a must to avoid reappearance of age spots. WHAT TYPES OF LASER TREATMENTS ARE AVAILABLE TO TREAT AGE SPOTS? Fractionated laser treatments are the best way to treat age spots. This type of skin care treatment should be done by a dermatologist or trained medical doctor. Fractionated laser treatments usually last one to two hours, depending on the amount of skin that is being treated, and patients usually see some results (which can include fading of the age spots) after the first treatment. Fractionated laser treatments also improve the texture of your skin, and can remove fine lines, acne scars and wrinkles, making them an all-in-one type of treatment for those who want to reduce the signs of aging. ARE ANY OTHER TREATMENTS AVAILABLE? The other type of treatment for age spots is Intense Pulse Light (IPL). This skin care treatment can reduce the appearance of age spots. However, this approach is not as effective as fractionated laser treatments, and may require three to five before any affects are seen. Other laser treatments are also available. In order to determine the best treatments for you, you’ll need to consult with a dermatologist or medical doctor. Dr. Price will examine your skin, ask you what you’d like to have corrected, and then recommend the treatments that will be most effective.